We started with “Folding Spectrogram” to answer the question: “What do you consider to be a self-organizing team”. We started with a long line ordered by experience with self-organizing teams. We asked the participants to double fold the line so the least experienced person would meet the most experiences to share their answers. After two minutes we double folded the line again and answered the same question to the two new people. Actually it was an impromptu networking with a folding line concept. In retrospect the group liked the folding concept once, but not the second time; to hard to see how to fold with pairs. Someone suggested to make a new line, with a new line-up, for each round and then fold again. To know more about self-organizing teams Marijn used “Celebrity interview” to interview me about this subject. I answered 6 prepared questions. After this 10 minute interview we did a “1-2-4-all” to come up with the two best questions of each group of 4 to have the interviewer ask the celebrity for another 10 minutes. In retrospect the suggestion was to have each group of 4 to ask the question themselves instead of the interviewer, to get them more involved. “What can you do as a facilitator to disrupt a self-organizing team” was the question. In a “1-2-4-all” the participants created a list of 10 most disruptive things they can do as facilitators to destroy self-organization in a team. This list contained e.g. “Only pay attention to mistakes”, “All communications and events by email”, “Take away the goal”. The second question in the TRIZ was “what do you sometime do that resembles (even if it’s only a little) an item on the list”. We used appreciative interviews to tell their story to another person and vice versa. After that he or she would retell your story to another twosome. That makes that you have to listen very carefully. What will be your 15% solution? “What will you change tomorrow to not disrupt the self-organization”. They came up with great solutions to implement tomorrow. In retrospect some participants said that is was hard to do an appreciative interview on a negative subject. It would also have been nice to follow-up on the 15% with a Troika or Caravan. The questions were not always clear enough. As LS facilitators we should check it more often, ask the group if the question is clear, so everyone works on the right subject. The Meetup was very welcoming to new people, they felt at home/warm, they likes the setup with the location and food. It creates a positive ambiance. It was not always known to everyone how much time they could use. Time was not visible. We should bring the visible clock again next time and a bell to signal the end of a time-box. It was easy to participate for everyone, the voice of more silent people was heard too. 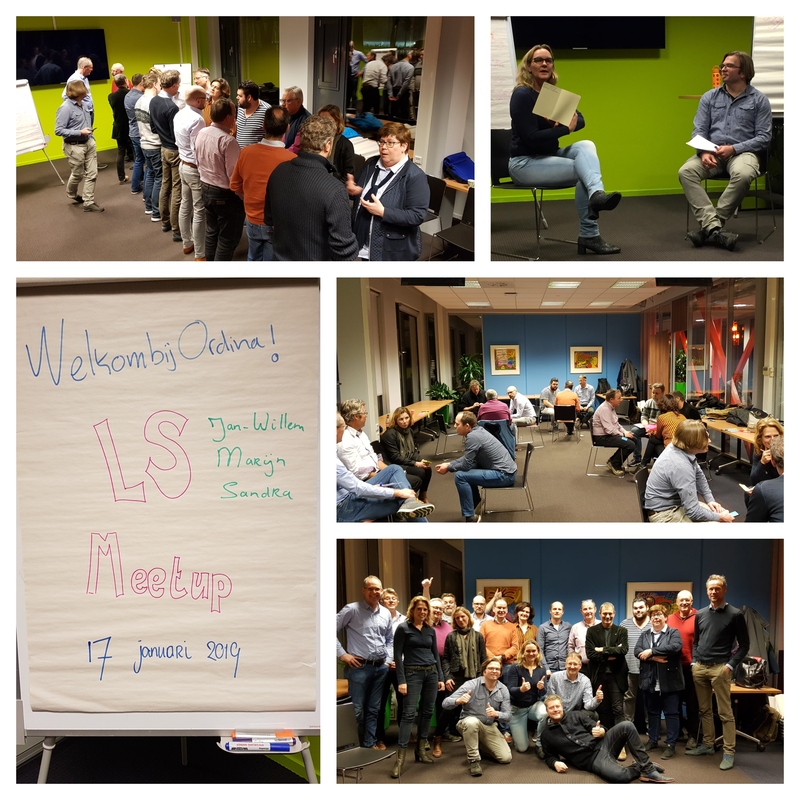 Almost everyone voted for a next Meetup with Liberating Structures. I’ll try too plan that in April. See you all there !